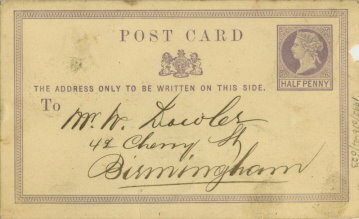 Great Britain postcard with a Sloper clip "cancellation" applied in Manchester. Postcards were clipped in bundles to speed up the cancelling of mail, but following complaints that parts of messages were being lost, the idea was abandoned. This means of cancelling postcards also gave no record of the date of posting.